I recently read a talk called “Of Things That Matter Most” by Dieter F. Uchtdorf that got me thinking about things. I love these talks that remind me to prioritize things and also to live in my season. Uchtdorf talks about two different events that illustrate the need for slowing life down when it gets difficult. First is to look at trees. When the season is ideal, a tree grows at a normal rate. When a season is not ideal, however, the tree slows down its growth. The energy is spent on the basic needs for survival. The second is flying a plane. Uchtdorf was a pilot for many years and talks about flying through turbulence. He points out that during turbulence, there is an optimum turbulence penetration speed that makes the flight through turbulence more smooth, and most of the time that means the pilot will need to decrease speed to get through it. He points out this also applies to speed bumps in a road. When I read that, I immediately, of course, thought about being a mother. 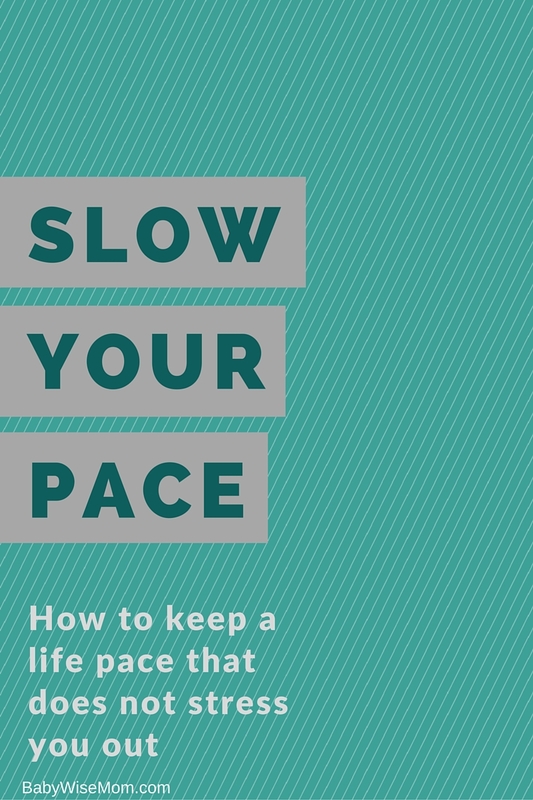 How many of us allow ourselves to slow down when we need to? Let’s take having a baby for example. I know some of you are wise and take the time to rest and heal after having a baby. I know others of you–especially on the second baby–have this need to prove to yourself and therefore the world that you can handle this. This isn’t too hard for you. You will be doing laundry on day three because you are afraid if you ever get behind, you won’t ever catch up (yes, that was me). I think having a newborn qualifies for a turbulent time in life. This is a time when it is wise to slow down and focus on the essentials of life. When I am pregnant, I am in bad shape. Pregnancy is very hard on me, and I have no choice but to cut things. I remember when I was pregnant with McKenna being concerned about cutting things from my life. I seemed so busy with essential things that I didn’t know how I would manage to do less and have the world continue to function. And I really noticed that a lot of things I did each day were nice and good, but not essential. I easily cut things and no one seemed to notice at all. You bet it is! And why not? There is so much out there to do! There is so much we want to be! We want to be good at so much! Excel at so much! We want our children to have great experiences in life. We want to be the best of every woman around us. We look at their great qualities and want to be just like that–and in this global community, you have a lot of women to look to who are great at something! Oh, stab. Right to the heart. My husband and I both found that line to speak right to us. We young mothers want to do it all. We want to be good at everything in our charge, and we want to reach out to others and help them. We desire good things, but sometimes to the point that our actions become a problem for us. We are familiar with the talk of “seasons.” We know, there is a time and a season for things. Maybe as a young mother with young children you just aren’t able to offer the service to your community you would like to. That is perfectly fine; you will have a season for that. So the trick here is to focus on what matters most, and what matters most in your season. There are a lot of good things we can do. There are even better things we can do. Then we have our best things to do. Don’t ignore the best for the sake of the good. You will have to let go of some good things in pursuit of the best. Your pace is individual to you and you will have to figure out what that is. You will have to decide what you believe are things that matter most in life and where your time should be spent. You can also try to think of ways to optimize and make easier tasks that need to be done. For example, work out a cleaning routine that makes things easiest for you. You do need to clean your house, but remember you have little kids who live there and it is okay if it looks that way. Uchtdorf counsels that we focus on four key relationships in our lives: with God, with our families, with our fellowmen, and with ourselves. Evaluate yourself in each of these areas and see where you need to improve and where you need to cut back. For me, I find what is vital in my relationship with God to be prayer, scripture study, and following His teachings. This is no small task of course! With fellowmen, you can find some way to serve others, even if all you can do is listen to others. You have a phone. You can write notes and letters. There are small things that mean a lot to someone else. You don’t have to do something grand like start a non-profit organization to serve your fellowmen. Finally, time with yourself. Get to know you. Spend time pondering. I encourage you to think through your pace and decide what it is, what it should be, and what you need to do to get to optimum. Do your best to live today so that tomorrow you won’t regret yesterday. But don’t expect to be perfect, either :). Love God, love your family, love those around you, and love yourself. To read this talk in its entirety, see Of Things That Matter Most. What a fantastic post and great examples for getting through to these young mothers (my) thick skulls haha! I just listened to this talk this week while scrubbing down my twins' high chairs — something I hadn't done in quite a while. I love your reiteration and application specifically to mothers — thanks! I am feeling emotional reading this. Almost every word spoke to me. It seems like I am (again) in a rough spot of toddlerhood. I have to remind myself I felt this way with my older son, too, and that this season will pass. Guilty, guilty, guilty as charged! Awesome! I love this talk. You articulate all of the "I knows" but don't always put into action. Thanks! You are all welcome! I am glad I am not the only one who needed it!